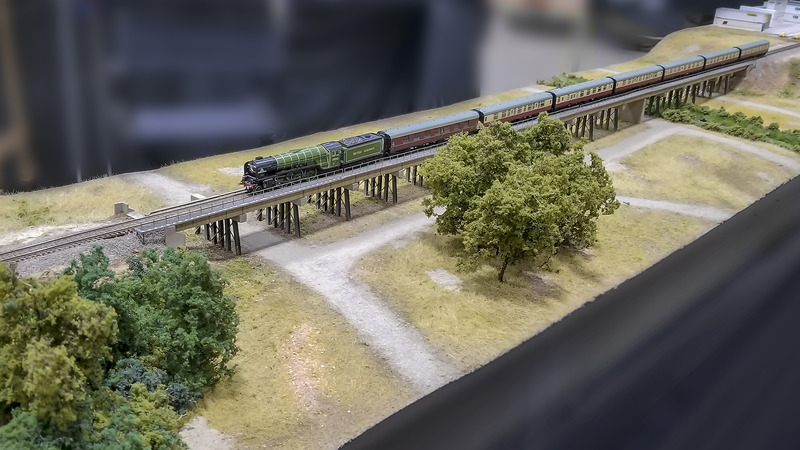 Here's the first of many pictures and a few videos I got from the National Train Show. What an amazing time! I hope to get stuff edited and posted through out the week. 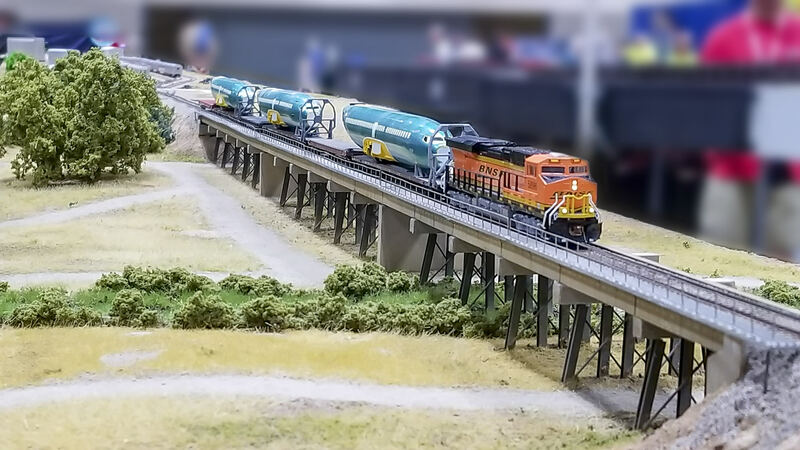 A few trains crossing the Yolo Bypass module built by Peter Keppel of Minnesota Free-moN. Very cool stuff, Mark. Thanks for posting. The pics and info you provide on FreeMo N always prompt me to consider joining the Minnesota group. I started talking to a few guys last year, but haven't quite got around to taking the plunge yet. Yes, the Minnesota guys are a great group to be a part of. 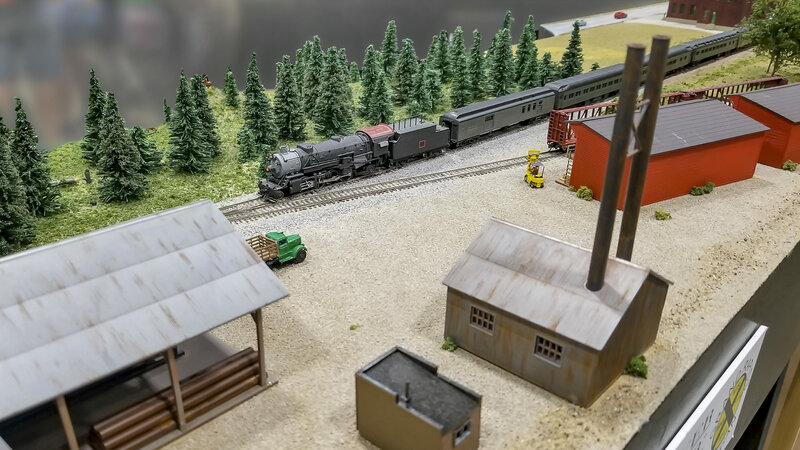 Very friendly, helpful, and talented modelers! 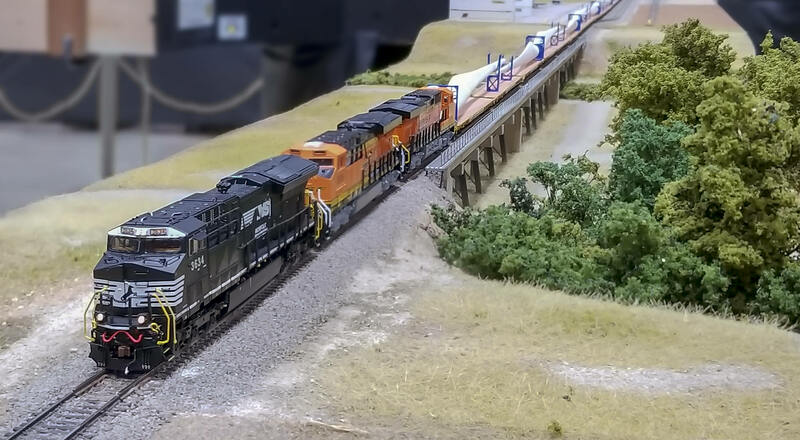 For the past several months, they have access to a facility allowing them to keep a layout set up and running. If you haven't operated with them yet, now it's easier than ever. 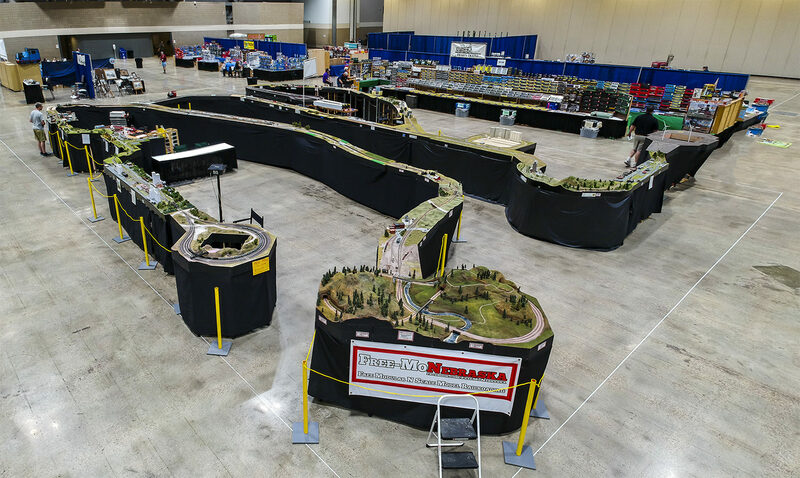 Now is also the time to get things started to be apart of next years National Train Show! Great stuff Mark! I’ve been following you guys for a while. 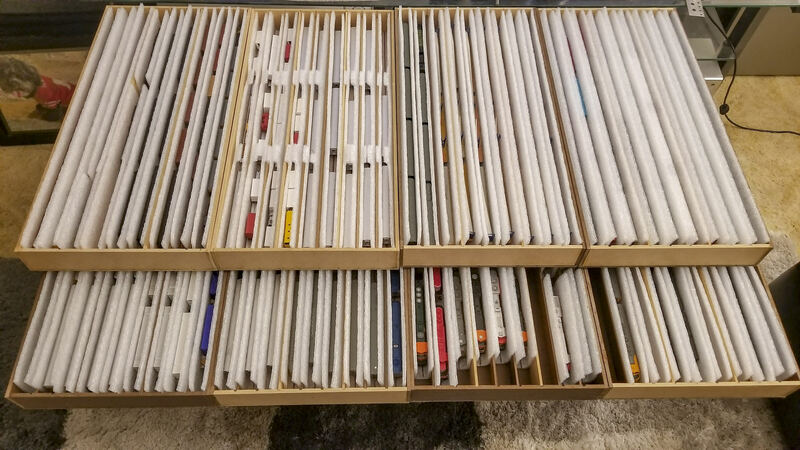 I’m curious about some of the DCC basics. I’m working on a home Layout of about 10-15 freemoN modules and was wondering if I would need anything above and beyond my NCE base station. At what size do you decide to add boosters? Do you divide large layouts into power districts? What about short management? 10-15 modules should be just fine with a basic command station. On solo shows, we typically operate from a single DCS100. If we have extra time, we sometimes drive the yard off a dedicated DB150. 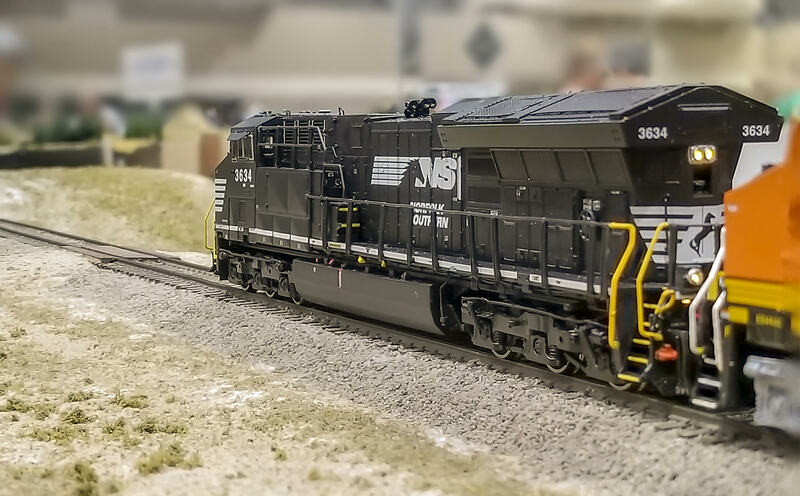 Aside from the dedicated yard booster, every other point has a PSXAR or PXS between the command station and the track. We run a master bus to each of our three loops, which splits into a PSXAR for the loop and a PSX which then connects to the module bus. We also run a master bus to the Wye which again splits into the Wye PSXAR and three PSXs to drive module bus on each leg. So essentially, 3 legs, each leg has 2 power districts and a loop. Then we just decide where to divide those power districts depending on which module sets make up that leg. 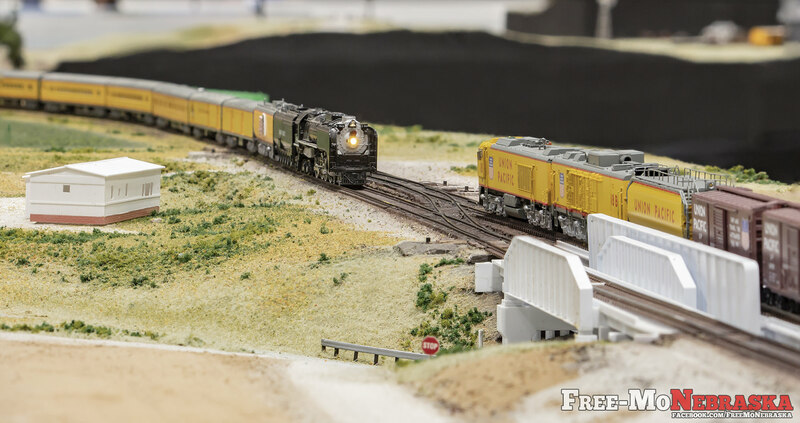 Here's a few more from the National Train Show. Mark, y'alls layout is really incredible. Don't think we have any Free-Mo N guys here in the Dallas area. Maybe I need to see if we can get something started down here. Would be a great thing to have a club here. I've heard a few rumors of some guys in Houston getting something going. I don't recall anyone in Dallas, until now. I always say now is the best time to get started, your deadline is July 2019. Looks like I forgot to share this video from SLC2018, joined by @RBrodzinsky with 12 modules from Silicon Valley Free-moN. 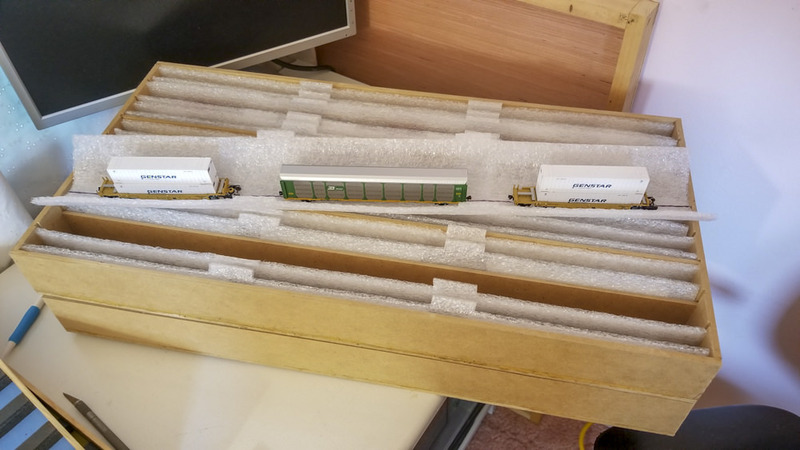 Over the last few weeks I've been designing and testing a new method for storage and transport. 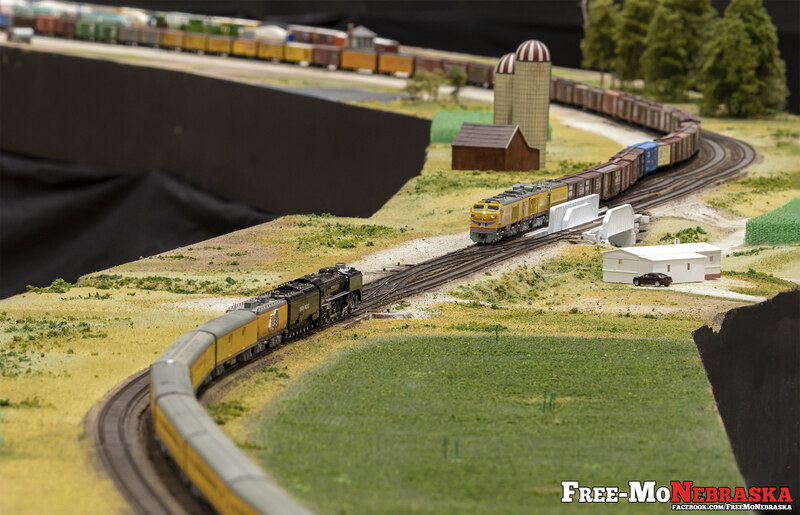 The design is adapted from one Paul Witty of MN Free-moN uses, and similar to FastTracks FreightCrate. 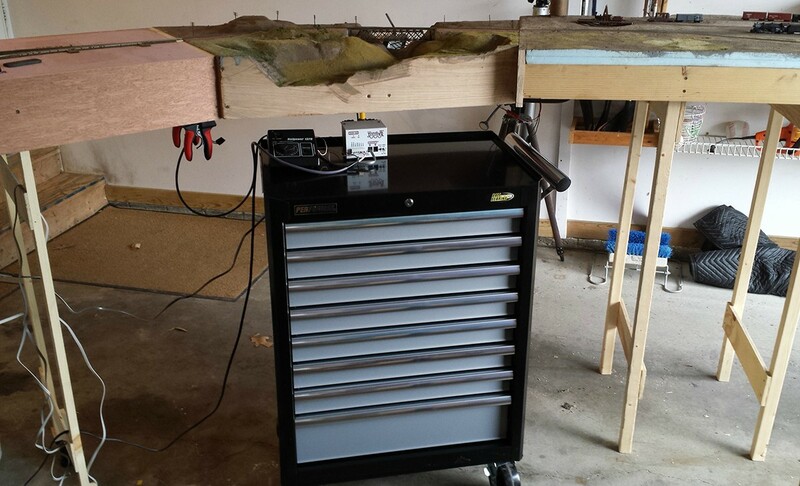 Currently I use a tool chest to hold trays in which equipment rests freely on their side. Each drawer holds two trays. Equipment is held by gravity alone. This method is pretty reliable in transit and very convenient once we get the tool chest unloaded. However, loading/unloading the tool chest is always a risk due to its weight. Since gravity is the only force holding equipment in place, the chest must always remain absolutely vertical. 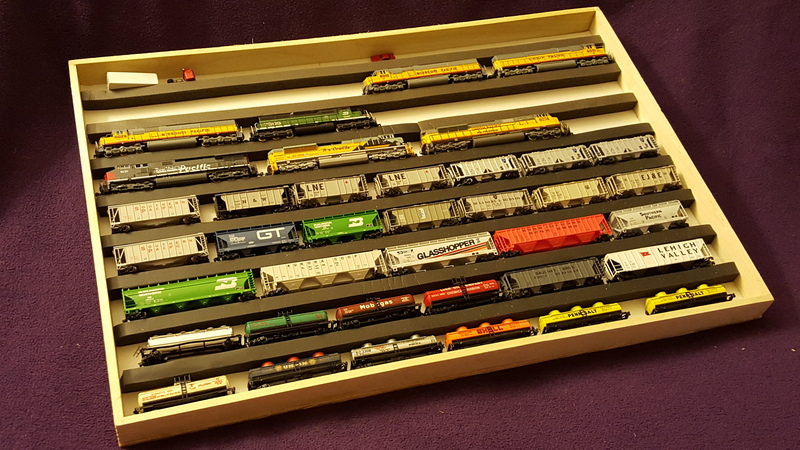 It can also be annoying to get at equipment on the bottom tray when adding/removing trains to the layout. 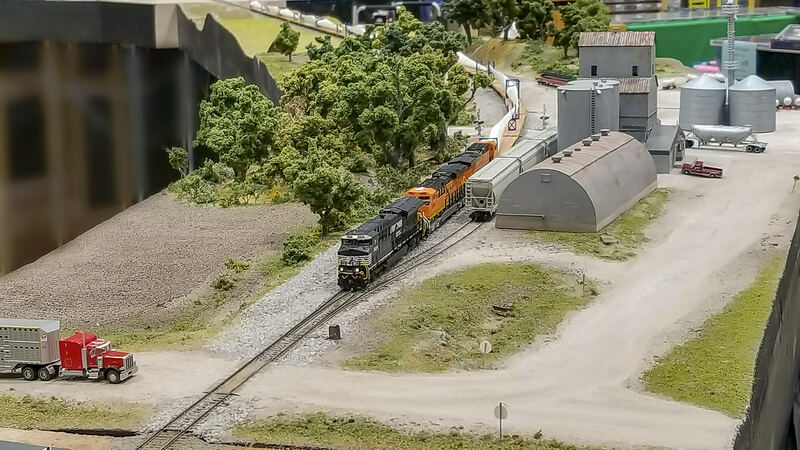 We've also found it holds more trains than we're able to run during a typical weekend show, which means we're taking up a lot of space for no reason. I've been periodically brainstorming ideas over the past few years, but got a big kick-start after seeing Paul Witty's method at the NTS last month. 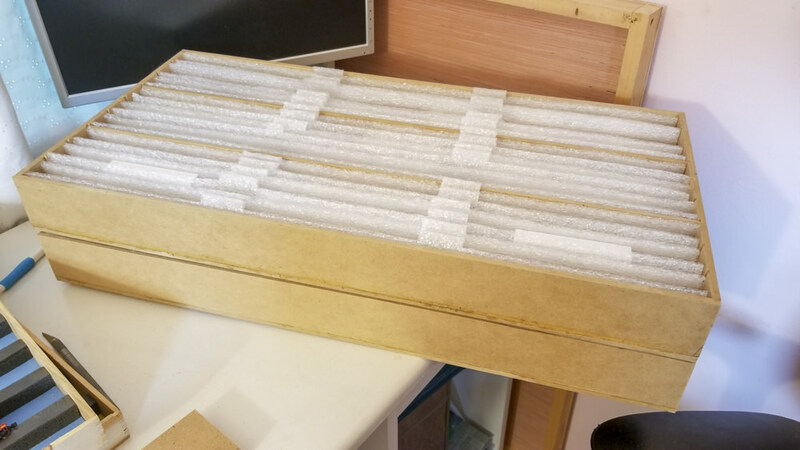 His is a a small hardboard box with slats and foam cradles. All equipment sits upright, held by gravity and a gentle side squeeze from the cradle. So far I'm 100% satisfied with the new method and will begin designs for modular/stackable holding cabinets. A PNW Free-moNster mentioned his transport chest/trunk doubles as viewing step stools (when unloaded), I might try that too. 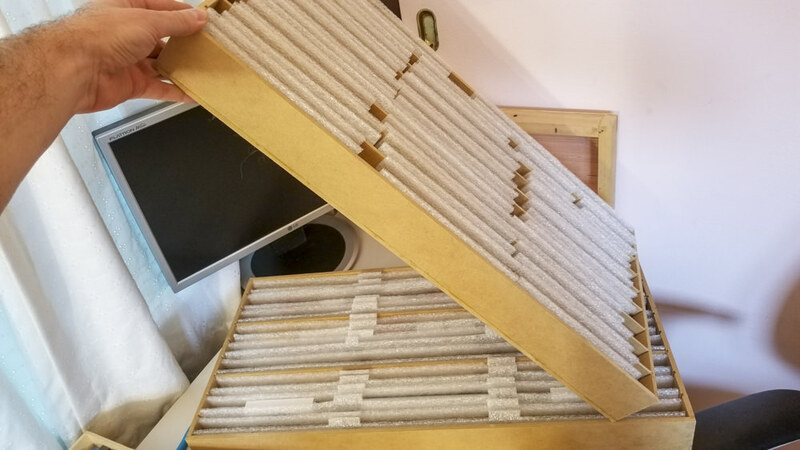 Nice- you could add a 1/8" panel or strips around the bottom panel under each one that would allow each box to nest into the top of the other, this way if several tip, one will not slide off the other. 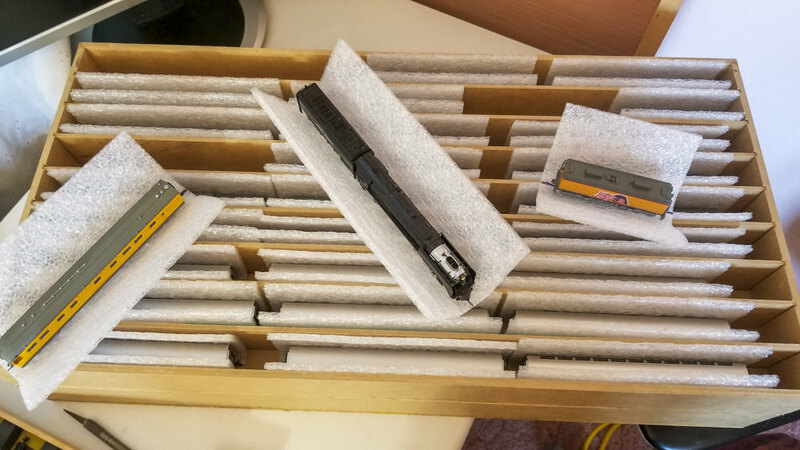 it would also allow them to stay nested if you strapped them all together as a unit, preventing one from sliding out of the middle of say a four box stack. Yeah, that's a good idea too. But one of the things we don't like about the current system is having to remove one tray to get at another. 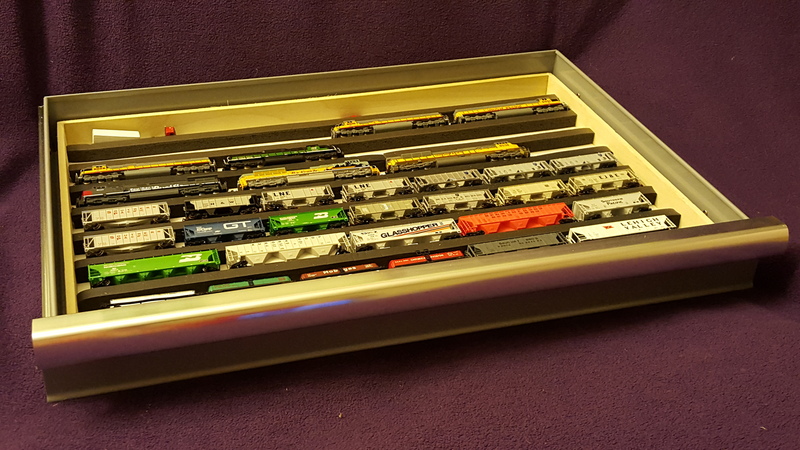 I'm imagining a box that will hold four of these new trays as drawers themselves, including a locking latch thing to keep them contained. 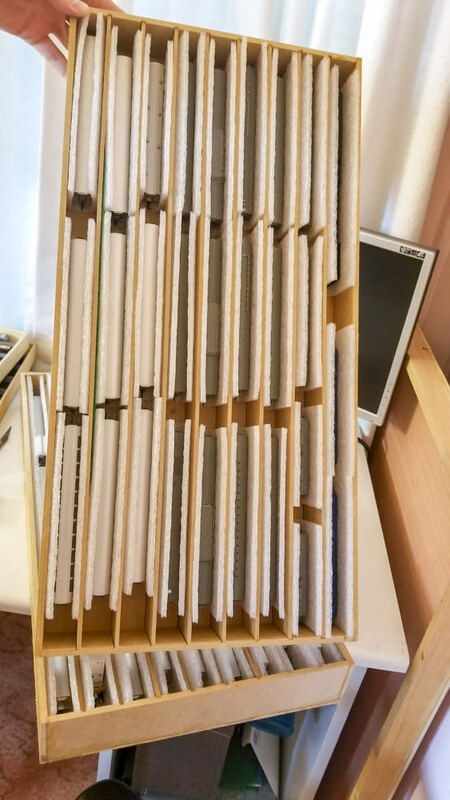 Now since there will be multiple boxes, I do plan to make those stack-able. Everything is fitting beautifully! I'll still need about 4 more trays/drawers, but today's goal is to build the first cabinet.